April was a busy month for all of us at GPM. We have activity buzzing all over the globe which is exciting! In this post, which we would normally issue a press release for, I chose a blog format as I wanted to share some personal thoughts rather than a quote. On April 16th, I flew to Moscow. This was my first visit to Russia and first by anyone in my family since my Grandmother in 1982, as part of a delegation of educators. I was treated to a tour of Red Square which was breathtaking and got to see the changing of the guard, and much more. I was amazed at the beauty of the city which comes alive at night and the warmth of the people everywhere I went. On Monday, we launched the inaugural GPM PRiSM Course with one to one translation from English to Russian. We were also joined by new GPM partners from Poland, Ewa Bednarczyk and Dorota Budzińska-Wiska. This course was different than most as it was also an introduction to our PSM3 Materiality Model and a way to see how GPM can support the needs of Russian academics and professionals. We unveiled our P5 Standard in Russian Language (free for download) and had a wonderful time doing workshops and engaging in dialogue. The course resulted in the first GPM certified Project Managers in Russia! Also, thanks to the hard work by our Executive Director Oxana Klimenko, we signed a memorandum of understanding with South Ural State University, and Omsk State University to integrate GPM courses focused on sustainabiltiy with an infusion of IPMA competence, the best of both worlds. On Thursday the 21st, we attended the ECO Forum put on by PM Alliance. Speakers form all over the world presented in a relaxed atmosphere that was brimming with youth. I had the opportunity to present a keynote and focused on how sustainable development, using projects as a vehicle, could be achieved and the need for project managers to take on the challenge. We later had dialogues with several leading figures including a representative from the Ministry of Ecology. As 2017 has been announced by Russian President Putin as the year of ecology, our dialogue focused on how we could create shared value together. This was symbolic as on the same day that all the nations of the world were signing the Paris Agreement. 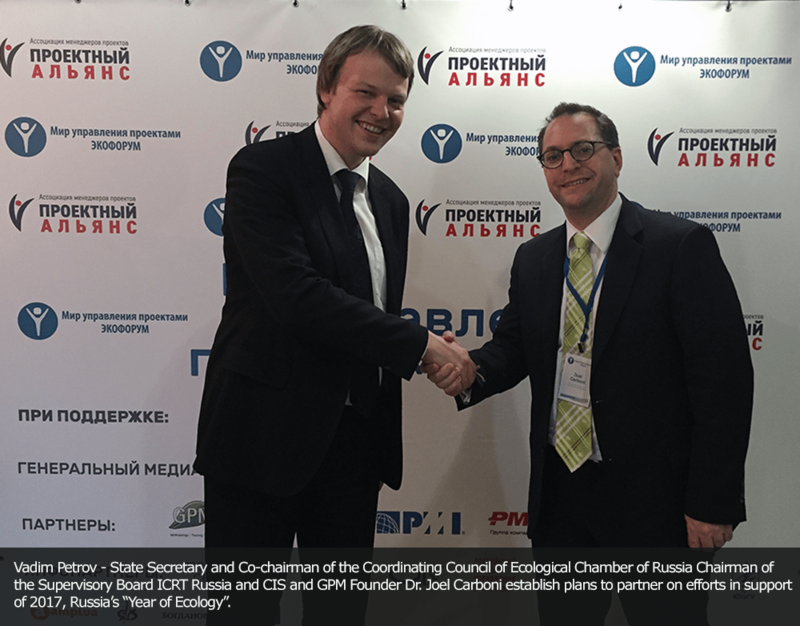 As GPM is a partner of Caring4Climate, we pledged our support through our CIS/ Russian office to do our part and are working on a formal agreement with the Russian Ministry who will support GPM. As founder, I can’t be more pleased to see our movement take up root in Russia. It is our goal to support sustainable development in every country in the world, one project at a time. GPM Certified Project Managers are Making a Difference!